This is Not a ‘Wife Beater’ (NAWB) is a Canberra-based, not-for-profit campaign that challenges language, attitudes, stereotypes and behaviours that minimise and condone intimate partner and family violence. 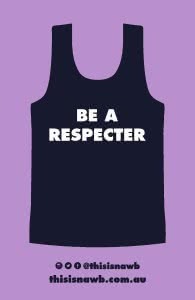 NAWB does this by reclaiming the singlets casually referred to as ‘wife beaters’, renaming them ‘respecters’, and using them as a symbol to promote respectful relationships, and safe and inclusive communities. A public photo exhibition at the Legislative Assembly on 11 August, featuring photographs of the campaign ambassadors and sponsors in ‘respecter’ singlets, will mark the launch of This is Not a ‘Wife Beater’ for 2015. The campaign encourages you to be a ‘respecter’ by challenging you and the people around you – your friends, family, peers, colleagues, and fellow Canberrans – to do something. You can help us to promote respectful relationships, and a safe and inclusive Canberra by hosting a ‘Be a Respecter’ Day following the campaign launch on 11 August. Hosting a ‘Be a Respecter’ Day enables you and your colleagues, friends or teammates to be ‘respecters’ in your workplace, community space, or at a social event. This event encourages you to engage in conversations about respectful relationships with your peers, to talk about your own understanding of and responses to intimate partner and family violence in the community, and to make your work or social environment more supportive of people experiencing this violence. Singlets are available for pre-order online and will be distributed following the campaign launch on 11 August. NAWB is still looking for sponsors, benefits which include: photos snapped by a professional photographer and featured in the exhibition/campaign launch on 11 August, marketing on the campaign website and social media, event coordination by a campaign representative, singlets, and promotional materials. This campaign is auspiced by YWCA Canberra and sponsorship is tax deductible. See our website for details. This campaign is made possible by the generosity of the Canberra community. By donating to or sponsoring the campaign, you enable us to spread our message of respect even further, and reach even more people in the community. You can donate using the form below. We will happily work with you to ensure your needs are met. Would you prefer a campaign representative come to you? We want to make this campaign as accessible as possible, so please let us know what we can do to get you involved. Get in touch via email at contact.nawb@gmail.com and connect with us on social media!